As the Roman influence waned the great cathedral schools were established to provide a source of choristers and clergy. Kings School, Canterbury dates from 597. 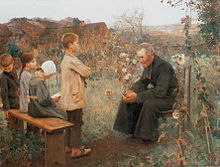 The Council of Rome in 853, specified that each parish should provide elementary education: religious ritual but also reading and writing Latin. :81 The purpose of education was pass on salvation not social change. The church had a monopoly on education, and the feudal lords concurred and allowed their sons to be educated at the few church schools. The economy was agrarian, and the children of serfs started work as soon as they were able. It was a truth, that man was created by God in the image of Adam with his share of original sin and a boy was was born sinful. Only the teaching of the church and the sacrements could redeem him. :77,85 The parishes provide elementary education- but had no requirement to provide it to every child. The need was to produce priests, and in a stable kingdom such as that of Charlemagne, administrators with elementary writing skills in Latin, and the arithmetic needed to collect taxes and administer them. Alcuin (735-804) developed teaching material that were based on the catechetical method- repeating and memorising questions and answers, though often not understanding. These skills were also needed in the great abbeys such as Cluny. There was a divergence between the needs of town and monasteries- and we see the development of parish, chantry, monastic and cathedral schools, and with the entry of women into church life convent were established and with them convent schools. Girls entered here at the age of eight and were taught Latin grammar, religious doctrine and music- and the womens arts of spinning, weaving, tapestry, painting and embroidery. :84 Bede entered the monastic school at Jarrow at the age of seven- a became a writer and historian. Chantry schools were the result of a charitable donation and educated the poor. Parishes had to have a school from 804, and cathedrals had to establish schools after the Lateran Council of 1179. Elementary education was mainly to teach the Latin needed for the trivium and the quadrivium that formed the basis of the secondary curriculum. Wealthy boys were educated by tutors. Others in one schools attached to the parishes, cathedrals or abbeys. From 13th century, wealthy merchants endowed money for a priest to 'establish as school to teach grammar', these early grammar schools were to teach basic or elementary grammar to boys. No age limit was specified. Early examples in England included Lancaster Royal Grammar School, Royal Latin School, Buckingham, Stockport Grammar School. The Reformation and the Dissolution of the Monasteries (1548) disrupted the funding of many schools. They petitioned the King, Edward VI for an endowment. Examples are King Edward VI Grammar School, Louth, King Edward VI Grammar School, Norwich and King Edward VI School, Stratford-upon-Avon where William Shakespeare was thought to be pupil from the age of 7 to 14. Certain movements in education had a relevance in all of Europe and its diverging colonies. The Americans were interested in the thoughts of Pestalozzi, Joseph Lancaster, Owen :208 and the Prussian schools. :4 The United Kingdom allowed most elementary education to be delivered in church schools whereas in France this was illegal as there is strict separation of church and state. This can be through informal assessment by the staff and governors, or by a state run testing regime. .
^ "Historical Timeline of Public Education in the US". Race Forward. 2006-04-13. Retrieved 2018-02-08.